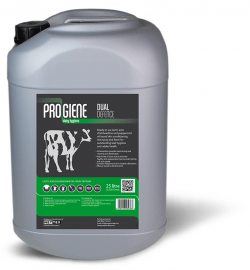 Progiene Dairy chemicals from Direct farm supplies. 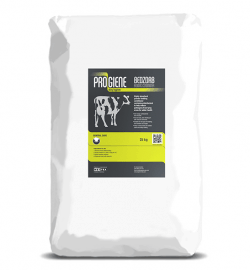 Please Email us at sales@directfarmsupplies.co.uk to get a quote for Progiene dairy chemicals. As well as supplying the Progiene range of dairy chemicals, Direct farm supplies can arrange for Progiene technicians to visit you on farm and advise on particular products which would suit your farming system. They can also do swab testing to identify areas of the dairy which are leading to high bacteria levels resulting in poor cow health and also penalties from Dairy companies and recommend a remedial programme tailored to help reduce bacteria counts and to ensure maximum efficiency in your dairy. We can also supply dispensing equipment for safe use of Progiene dairy chemicals, Gloves, Paper towels and teat wipes. Most of the Progiene range of dairy chemicals are available in 5ltr, 25ltr, 200ltr or 1000ltr IBC’s and are suitable for use with spray lines such as Ambic spray systems. We can match Progiene products with Dairy chemicals from other brands such as Kilco ampra san, Deosan and Evans vanodine so changing to Progiene shouldn’t be to much of an issue. The innovative Progiene range has been developed to meet current dairy farmer needs and offer cost effective milk quality solutions. Premium quality and effectiveness come as standard and all products are manufactured in accordance with ISO 9001 and GMP protocols. Our new range of lactic acid teat dips provide the answer to effective bacterial kill whilst exfoliating dead skin which can harbour bacteria. Lactic acid can also help to remove keratin, the hard skin that can build-up on teat ends leading to increased clinical mastitis. The range is available in sprayable or barrier formulations providing a versatile choice suitable for all milking systems. Our extensive range of iodine teat dips, sprays and foams has been specifically formulated to provide pre and post milking udder health solutions to suit individual challenges found on farm. Whilst disinfecting teats, the high levels of glycerine and lanolin will leave teats feeling smooth and supple and in superb condition. This range has been designed to offer superb value for money from high performance chlorinated disinfectants. Suitable for sanitising automated milking equipment and bulk milk storage tanks. Disinfectants can also be used for the cleaning and sanitising of utensils and equipment and is safe to use for the cleaning of calf feeding equipment and buckets. This range of highly effective alkaline cleaning chemicals has been designed to offer ultimate performance to ensure the production of high quality milk when using all types of milking machines. Our formulations are effective in the removal of fat and protein deposits whilst leaving surfaces free from bacteria. The range consists of liquid and powder cleaners ensuring a choice of versatile products to the end user. Acid products are effective against milkstone deposits (the combination of minerals in milk and water) and work by dissolving minerals and holding them in solution until the wash solution is discarded. They often contain either phosphoric, sulphuric or nitric acid, although phosphoric acid tends to be most commonly used due to its non-aggressive effect on stainless steel equipment and plastics. Our range of caustic based products is designed to remove fat and proteins from milking equipment. From traditional powder cleaning of bulk milk tanks to products for soaking milk filters, we can offer solutions to meet your every need. Our General Care range consists of high performance foaming and non-foaming pressure washing detergents, non-chlorinated liquid cleaners for automatic bottlewashing systems, hand sanitising and cleaning products and a highly absorbent bedding powder have been specifically formulated for use on livestock farms. When cows are dried off it can take a week for the natural protective plug to form. T-Hexx® Dry-E provides a physical anti-bacterial barrier, giving environmental protection to the teats during this period.